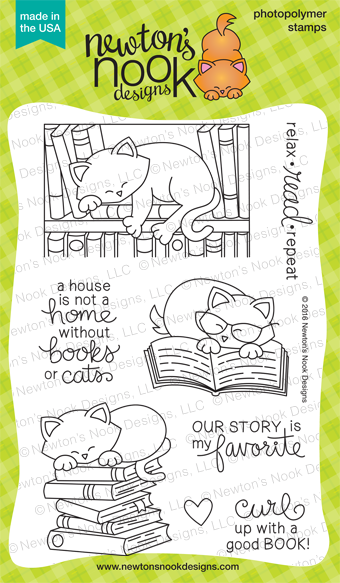 Today is our Third Reveal day for our May Release and we are featuring the new Newton's Book Club stamp set. We are giving the stamp set away to one lucky winner so make sure you read all the way to the bottom of this post to see how to win! Love to read? 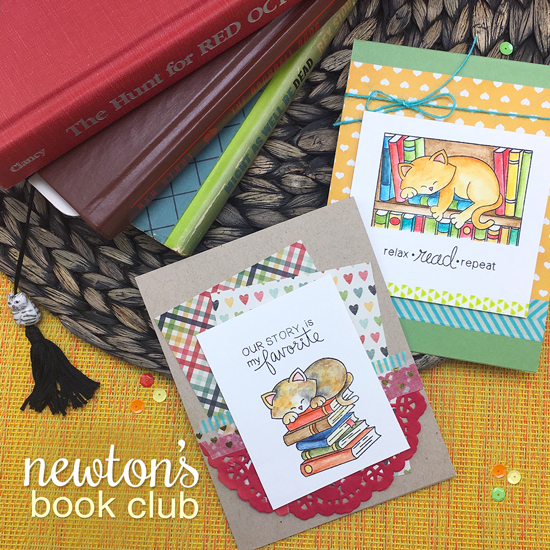 Join Newton's Book club in this fun new 4 x 6 stamp set! Our favorite feline is curling up with his favorite books, whether it's to read them or nap on them, we are not sure. Either way, these adorable stamps will be perfect for creating cards for all the cat and book-lovers in your life! This set also includes some great sentiments that will help you make versatile cards for any time of year! Sit back, relax, and enjoy! Ready to join "Newton's Book Club? Check out the fun inspiration from our Design Team & Guest! Scroll down to see all the projects below from our Design Team & Guest Designer below - Then, make sure to click through to all their blogs for details on their cards - Some of the designers have extra cards on the blogs and you might even find a fun video or two along the way! Make sure to comment for a chance to win! Details on the giveaway are at the bottom of today's post. Samantha created this sweet card! I love how she colored the cat and books, giving them cut little white accents with a gel pen! So pretty and colorful! 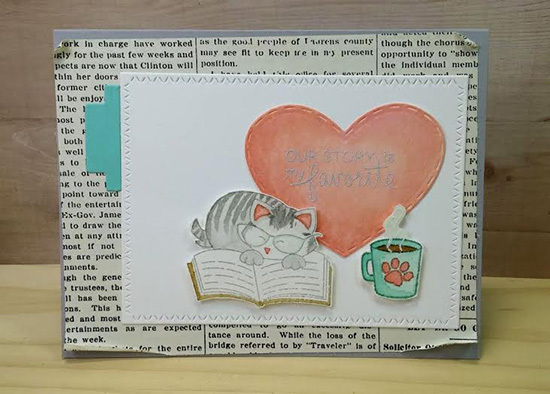 Kimberly created this adorable card with a removable bookmark! Love this idea!! This sweet card by Lydia is so adorable! 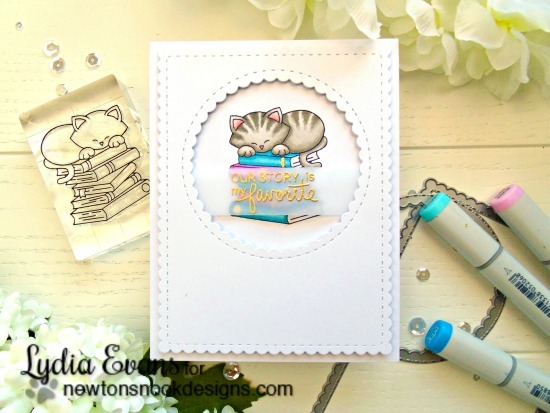 I love the simplicity of the white card with colored kitty and books! The added sentiment embossed on vellum gives the perfect finishing touch! 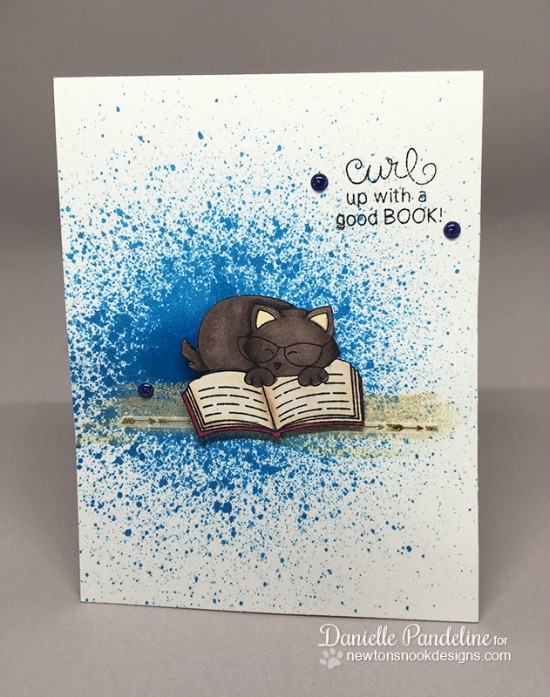 Our Guest Designer, Naki, created this adorable card! I love the way she added the sentiment onto the heart from the Darling Hearts die set! And she included a cup of coffee from the Newton Loves Coffee Stamp set. 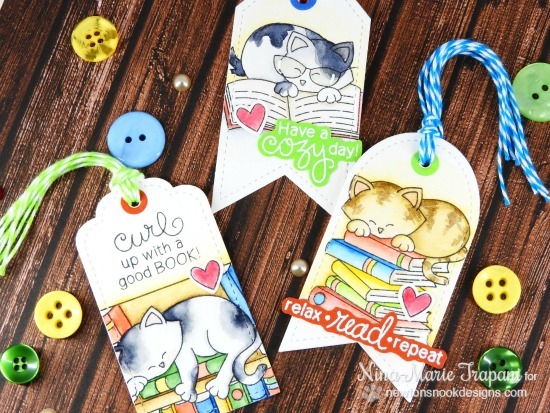 Nina-Marie created a trio of adorable bookmarks using the kitty images! I love how she colored all the kitties a bit different! Any book reader would love these to help keep their place! 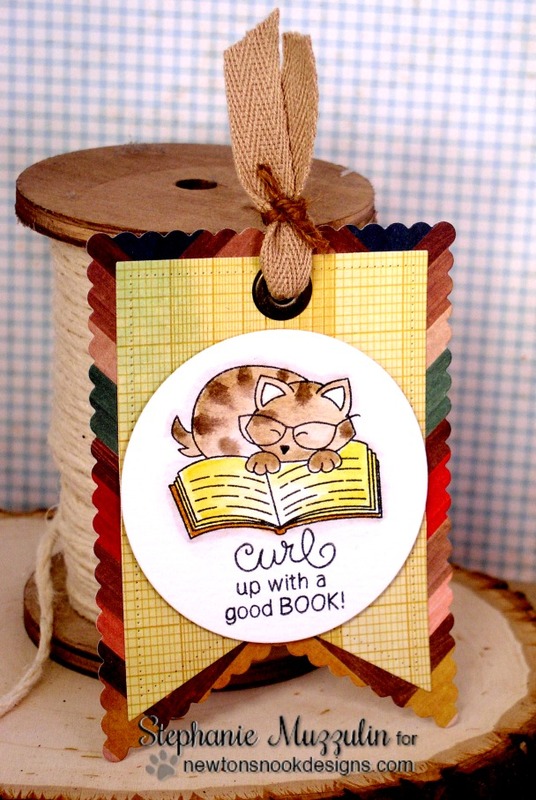 I love the gorgeous colors on this adorable tag by Stephanie! It would be so perfect to tie onto a gift or to use as a bookmark! 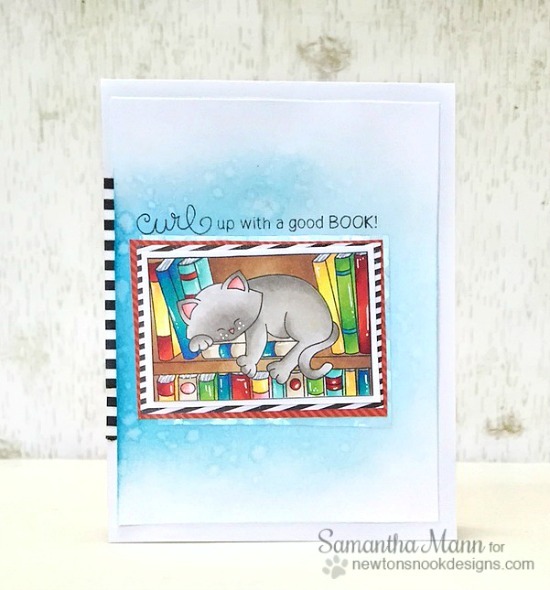 Danielle created this fun card! It's so cool how she used the blue splatters to draw your eye into the image of the kitty reading! 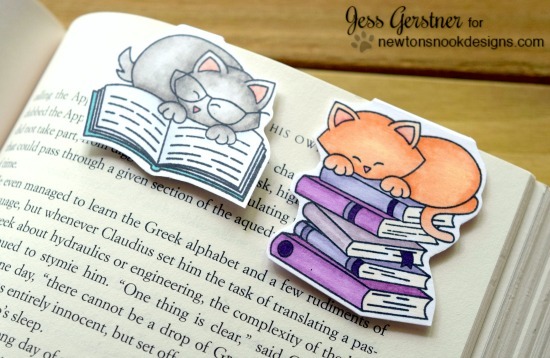 Jess created this adorable little bookmarks! What a fun way to keep your spot in your favorite book! 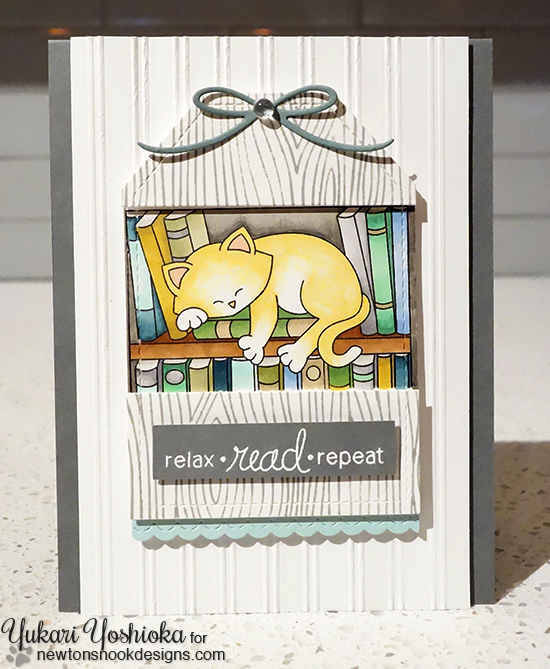 Yukari created this charming card, fitting the image of the Kitty on the bookshelf onto her tag! Isn't her coloring on the cat and books amazing? 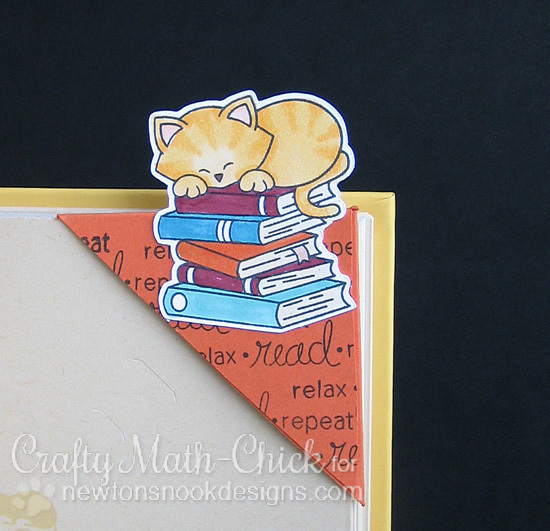 Crafty Math-Chick created this super cute corner bookmark! Won't it be fun for the user to see Newton peeking out above the page? So adorable! Larissa created this adorable interactive, slider card! I just love the rainbow stack of books too! She also has some other projects on her blog, so be sure to check them all out! Would you like to win the “Newton's Book Club” Stamp Set? Love this one! Books are one my favorite things. Super fan and cute set! Great cards and lots of inspiration from DT too! Oh two of my favorite pastimes--kitties and reading! I am so loving this set and the DT's amazing creations! Gonna have to have this one. Love books! OMGosh what a wonderfully cute MUST HAVE set. Thanks for sharing. Your cat images are adorable and even moreso among these books!!! ♡♡♡ I really love this set! :) What a great blog hop! Excellent job everyone!!! Awe! Cute set and great sentiments! I love this set! It is exactly how my baby helped me to read. Great set along with great ideas to use it! what a fun stamp set! Squeee!!! This set is TERRIFIC!! Loved all the fab projects! Can't wait to get these!!! I love this stamp set--it is the best! 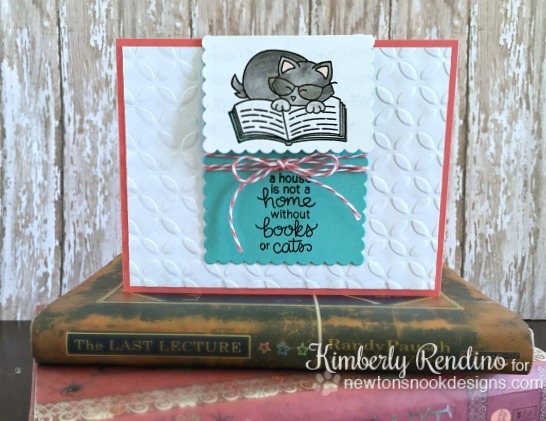 What a fun set - cute Newton and the love of reading united in one awesome stamp set!! I am off to see your designer's creations and leave them some love!! What an awesome stamp set! Each one is absolutely adorable! Newton ! I love him and even more reading : books are my second passion ! oh my goodness what a sweet new set!! Love all the adorable creations!! Wonderful and sweet set. Love all of today's projects. I'll be getting lots of use out of it. I am in love with this set -- cats and books? Yes, me'owm. I am such a big fan of Newton! Adorable cards and a fun new set! Two of my favorite things, cats and books. Great examples. Hope I win this set. I love kitties so this is my favorite set! All the samples are just adorable. Two of my favorites, cats and books~! A perfect day has both. I am totally in love with this set. Cats and books, a perfect pairing of my two loves. I would love to use it to make make many different projects including bookmarks for my students. This new set is SO much fun! I love the kitty on the books! Everything about this new release is amazing! Love everyone's projects especially the bookmarks! I love the slider card! I didn't think to make bookmarks with this set, the DT really inspired me! I love Jen's cards too, lovely coloring! Awwweeeeee....kitties! What an adorable set! Awwww!!!!! I love this set!!!! Very very cute!!!! Such lovely cards!!!! Oh my goodness, I adore this set! I would love to be "CURLED UP WITH A GOOD BOOK" today....instead of at work! What a fabulous stamp set. I love Newton curled up on top of the books. Great cards showcasing this cute set! What a cute set of stamps. I love what the artists have done with them too. Great designs. What a great set, especially like Newton in the book shelf! I love this set! It has my two favorite things - cats and books. Great examples from all the participants too. This release is very cute. Love all the stamp sets. Super cte cards and bookmarks!! Love this set soooo much, I have 2 kitties!! Great cards and bookmarks. Adorable set. These examples are ALL winners in my book! Gotta have these sets!